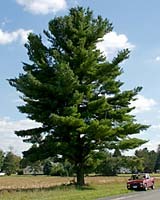 Terry L. Ettinger Horticulture Consulting Services - Recommended Trees for Central New York Landscapes and Gardens. Hundreds of different trees can grow well in here Central New York - dozens of which are native to our forests and woodlands. As is the case with all plants, however, the key to growing them well is to plant them in the right place. For example, our native white pine (Pinus strobus), at right, can grow two or more feet per year into a spectacular tree that's more than one hundred feet tall and twenty to forty feet wide (note my truck in the lower right corner of the picture)! Therefore, despite its stunning beauty and being a "native" plant, I'm awfully hard pressed to recommend it for anything but the very largest properties. Unfortunately, I can't begin to count how often I see this tree planted within ten or fifteen feet of a home, or within ten feet of each other in an attempt to create an evergreen screen or hedge. So, with this bit of philosophy as a backdrop, the trees that I'll be recommending here may tend to be a bit smaller than you might expect (as most properties aren't big enough for even a single typical shade tree) and will often offer multiple seasons of interest via spring flowers, colorful fall fruit and/or foliage, unique "architecture," interesting bark, etc. So check back often to see if I've recommended a tree that might be perfect for your landscape?